Eun’s fiction contrasts familial or societal obligations with an undertow of erratic impulse or emotion. 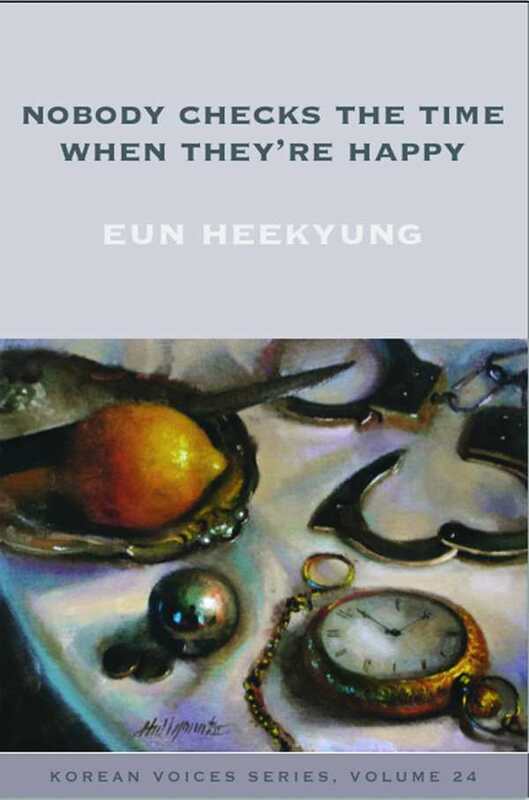 Nobody Checks the Time When They’re Happy, a collection of short stories by Heekyung Eun, peers into the lives of various South Koreans and forms its own small universe of poignance and melancholy, wonderfully interspersed with offbeat humor. Eun’s characters are bound by common nationality and culture, which sometimes provides a unifying stability yet also creates feelings of conflict and confinement. There is an emphasis upon subtle gestures or moments, but the scope of the fiction meanders about appealingly while maintaining a compact tension. In “An Obviously Immoral Love,” a young woman’s relationship with a married man parallels her father’s surprising extramarital affair. Another young woman cares for her hapless mother, once quite beautiful with high expectations from life, now dying of cancer and utterly baffled by her fate. Bar owner Hye-lin enjoys serving customers and listening to their confessions—but she only wants to hear sad stories, since the others seem meaningless and forgettable. Eun’s fiction contrasts familial or societal obligations with an undertow of erratic impulse or emotion. The Kyobo Building’s huge electronic billboard advises everyone to work like an ant because summer is fleeting, yet within the same area, drunken men “stagger from a darkened alley like maggots crawling out of a roasted chestnut.” A young wife has made the appropriate marriage to a “quiet, nervous” and bespectacled researcher, but she neglects her domestic duties to visit Hye-lin’s bar, the only place where her otherwise intense anxiety goes away. Quizzical and engagingly varied, the stories of Nobody Checks The Time When They’re Happy resonate with memorable characters and dialogue, and offer an intriguing glimpse into contemporary South Korea.